It’s been one of those weeks where i’ve just come home mentally and physically tired every evening. It’s not that work has been particularly stressful; in fact, if anything, work’s been quite enjoyable lately as i do various bits of project management for new e-books, write artwork briefs for new stories, and review manuscripts. But this busy-ness at the office translates to me just looking forward to some home cooking and relaxing with tea and a book after dinner (or Battlestar Galactica — WS and I are completely hooked :P) by the time 5 o’clock rolls around! Dibs on the crispy skin! I roasted it with a little soy sauce and chopped shallots for extra flavour but it will taste equally nice on its own, or with garlic, onions, spring onions. 2. 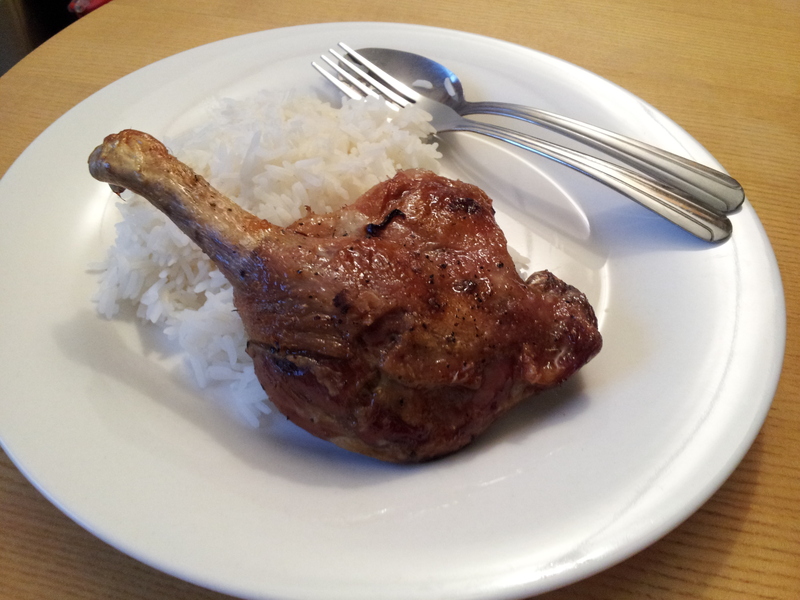 Rub duck legs with salt and black pepper. 3. Wrap duck legs in baking foil. Add a little soy sauce and shallots if desired. 4. Bake duck in oven for 45 minutes wrapped. Check duck after 45 minutes. Unwrap foil. Bake for a further 15 minutes to get a nice crispy skin. 5. Serve with hot steamed rice, or roast potatoes.